The hottest surfer in France had to be Filipe Toledo. The rookie Brazilian was having a pretty quiet season before busting loose in the punchy beach breaks at the two contest spots, La Graviere and Le Penon. He let the field know it was on in round 3 when he dominated Jeremy Flores, boosting a huge alley oop in the process, the move of the contest (video below). Filipe continued his hot form, pulling a huge upset by knocking off Kelly Slater in the quarterfinals. 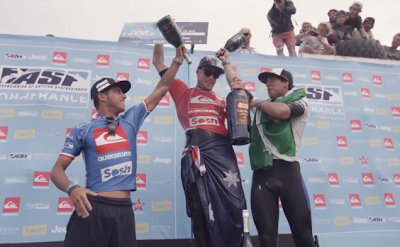 But then in the semifinals, fellow Brazilian Gabriel Medina pulled out some airs of his own to knock Filipe out of the competition and advance to the finals. Mick Fanning meanwhile was marching through the other half of the draw. He took out John John in the quarterfinals with relative ease, posting wave scores of 8 and 9 early in the heat before John John could even get any real waves scored. Next up for Mick was his mate Joel Parkinson, their 20th heat surfed against each other. Mick, the rankings #1, was able to edge out Parko, the defending title holder, in a closely fought heat that finished 16.10 to 15.03. The finals matchup of Fanning vs. Medina went off, unfortunately, as the wave conditions were deteriorating. Mick jumped on the first wave of the heat, snapping 3 strong turns off the top, and grabbing a 7.83 for the early lead. Mick and Medina then traded 6 point waves before Medina stomped out another air rotation for an 8.50 to move into the lead. With 7 minutes left in the heat, Mick put together a projection floater - top turn - tail throw to score a 8.83 and jump back into the lead. As the tide dropped, Medina couldn't find the left he needed over the last few minutes, and Mick claimed the crown, 16.66 to 15.00. The WCT next travels to Portugal for the Rip Curl Pro, October 9-20.